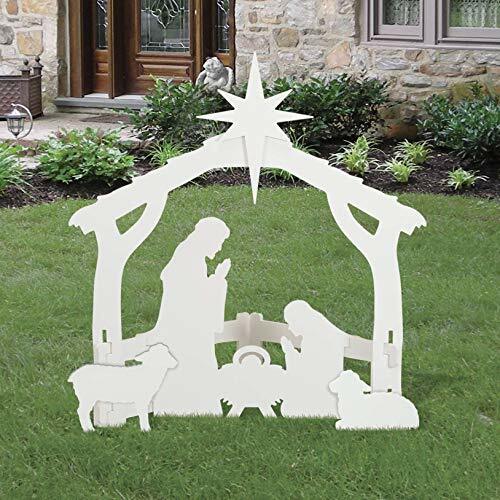 Proudly display this stunning silhouette style Nativity that symbolizes the true meaning of Christmas! Beautiful during the day, at night this pure white design becomes a real eye-catcher illuminated with just a small spotlight. You'll love the peace and serenity portrayed in this simple yet timeless design so much, it will instantly become your favorite. Quality manufactured with pride in the USA, all pieces are precision cut from durable, all-weather plastic board that will not rot, split, fade or delaminate. This quality display will give you many years of enjoyment. An official licensed product authorized by the copyright owner of the original self-standing silhouette Nativity, this display measures 47" wide and 50" tall to the top of the star. Yard Stakes are included to hold it in place on those windy days. Ours is the original silhouette Nativity. Our copyrighted design places the Nativity characters closer to the front for better visibility from all angles and distances than rectangular designs. Assembled display (without sheep) can be carried in one piece. Stores flat in the off season. A very high quality product for the price. Compare other designs at a much higher price. Simple yet elegant all-weather display looks fantastic in any yard! Assembled display measures 47" wide x 50" tall x 22" deep.